In search of a new pub this week, I bowed to Dad's memory. He had heard tell, maybe even seen a pub near Exton, but wasn't sure what it was called. So with our target selected, we saddled up and headed off on another adventure. 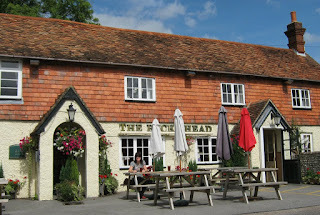 It turned out that the pub in question was called The Bucks Head, and is located in Meonstoke. It looked like a nice country pub from outside, and so it proved on the inside too. A warm greeting and lots of wood were in evidence, along with the spitting of an open fire. Unfortunately, the fire was on its way out, not to flourish again during our visit. A particular shame, as it was a rather cold day, and the pub could have done with an extra heat blast. There were plenty of tables for us to choose from, although the pub would fill up over lunchtime. This is incidentally a dog friendly pub, popular with walkers, AKA, ramblers. The menu read pretty well, with average prices between £12 and £15, pretty standard for your modern gastro pub. All the usual pub classics were in situ, with the addition of a few more imaginative offerings. There was also a specials board for extra spice, and this is where my lunch was advertised. Jerk chicken with sweet potato wedges, served with homemade coleslaw and corn on the cob. Dad picked out one of his favourites, ham, egg and chips, with the added flourish of a pineapple fritter. This is one of those little touches that we really appreciate, to lift a meal in to a more interesting dimension. Two of the basic pub fundamentals were not in practice here. Firstly, there was no music, although there was enough custom generating sufficient noise to avoid the painful silence syndrome. Secondly, it was a bit cold. When the food was delivered, it looked pretty good, and more significantly, tasted pretty good too. My chicken, although not the biggest, was perfectly cooked, and was ably assisted by a small pot of spicy sauce. The sweet potato wedges were again perfect, not too soft, and not over crisped, as can easily be done when trying to produce the perfect sweet potatoes. My coleslaw was clearly homemade, and the corn was sweet and coated in butter. Dad's ham was maybe, just possibly a tiny touch overdone. The chips however were truly epic. I'm not meant to go on too much about chips, but if you want to see how a chip should be made, this is the place to go. His two eggs were poached, one more runny than the other, I suppose variety is a good thing. We were very impressed that the pineapple fritter was made from fresh pineapple rather than a tinned ring. All in all this was a thoroughly good lunch adventure. The pub is nice, light and friendly. 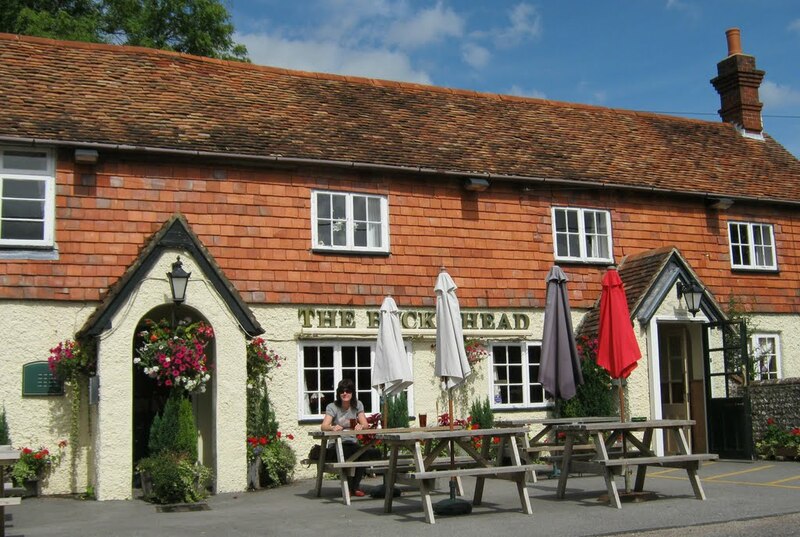 The food is very good, and the prices are bang on average for a good foodie pub. They are just a spiders pencil away from getting it all 100% right. A bit of music and some love shown to the fire would have gone along way. Perhaps examine the idea of a set lunch menu? It's only a small thing, but we did think the dying fire was a real shame. It's not just the warmth it gives off, but the pleasing aesthetic quality. Everyone loves a roaring pub fire in the Winter. That said, this is a very good pub, and we would happily return, and maybe we will.